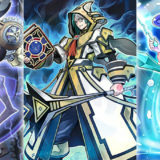 ABC started out really strong, but the arrival of Zoodiac warped the metagame to their image. 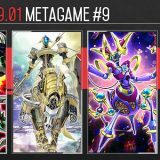 Compiling a total of 668 top-placing decks from 101 competitive Japanese and Asian tournaments, here is the final metagame breakdown of the OCG 2016.10 format. 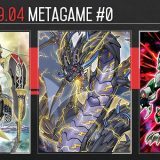 Just 1 week after their debut, Zoodiac swiftly usurped ABC and dominated the OCG 2016.10 competitive scene. 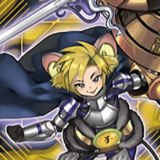 Zoodiac has a core combo that allows it to generate +3 card advantage from just 1 Zoodiac Ratpier. 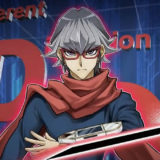 Having Fire Formation – Tenki, Zoodiac Barrage and Speedroid Terrortop into M-X-Saber Invoker to bring out Zoodiac Ratpier, Zoodiac is extremely consistent in pulling off their combo. 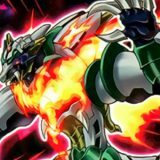 Limiting Speedroid Terrortop and Fire Formation – Tenki reduces the consistency that Zoodiac can pull off their combo on the first turn. 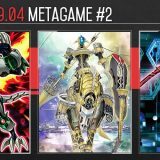 Zoodiac will not be as dominant going into the OCG 2017.01 format, but remains a strong contender. 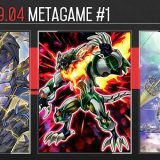 Metalfoes is the only remaining deck from the OCG 2016.07 format that managed to adapt and thrive in the OCG 2016.10. 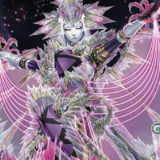 Given up on Blackwing – Gofu the Vague Shadow and Ultimaya Tzolkin, Metalfoes assimilated Zoodiac and became better than before. 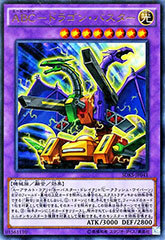 Zoodiac Drident and Majespecter Unicorn – Kirin is one of the toughest opening to break, especially since Kirin is immune to popular board wipes such as Dark Hole and Interrupted Kaiju Slumber. 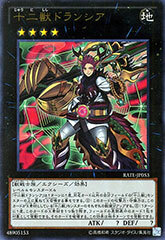 With Majespecter Unicorn – Kirin gone, Metalfoes has a much weaker opening that is susceptible to board wipes. 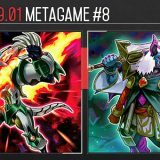 Players are now testing out Astrograph Sorcerer – although it synergizes with Metalfoes, it is inadequate in exerting the same threat that Kirin did. 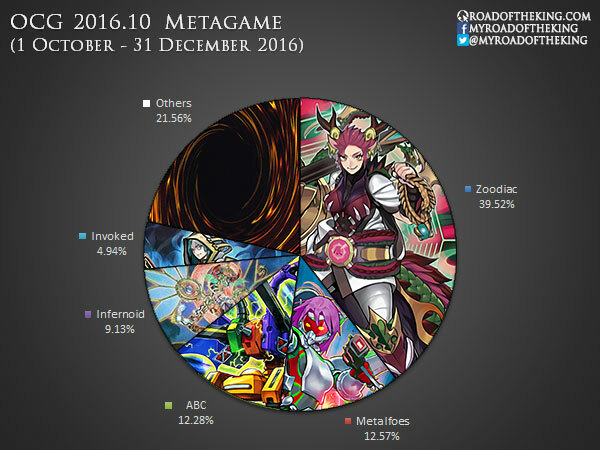 ABC had such a strong lead in the initial weeks of OCG 2016.10 that despite its sharp decline, it still outnumbered Infernoids. 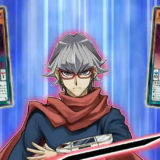 ABC has a similar gameplan as Zoodiac, but without the card advantage and half the consistency, ABC is too slow against Zoodiac. Being unable to effectively utilize the Zoodiac engine, ABC has fallen out of favor. 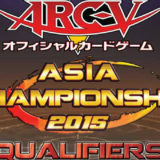 ABC is pretty much out of the competitive scene, limiting Union Hangar is just flogging the dead horse. 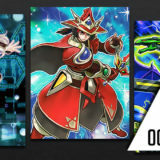 Counting from Week #2 onwards (after the release of Raging Tempest), there were a total of 581 top-performing decks in OCG 2016.10. 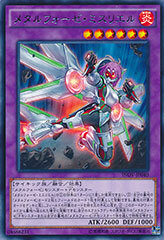 Out of those 581 decks, 264 were Zoodiac decks, and 150 were decks running with Zoodiac engine. 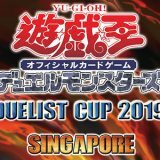 Only 167 decks were not running any Zoodiac. 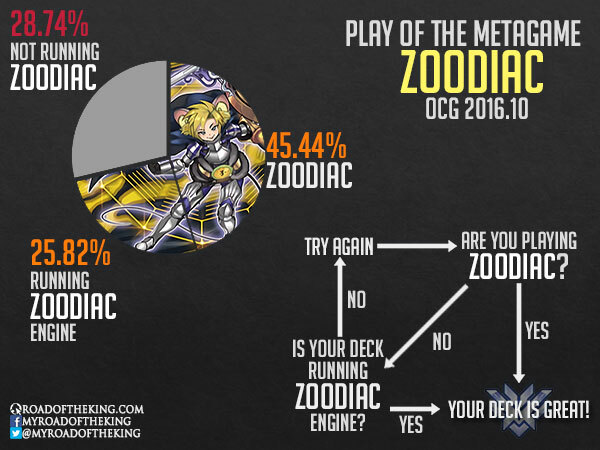 Combined, 71.26% of the decks had Zoodiac.